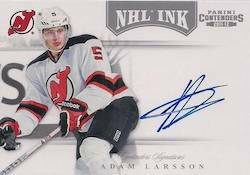 If autographs are your thing, 2011-12 Panini Contenders Hockey is for you. Offering three or four signature cards per box, almost all of which are on-card, collectors can expect to find a lot of ink from NHL rookies, veterans and legends. Falling one per case, book cards feature as many as six signatures. These high-end case hits are the only sticker autographs in the release. 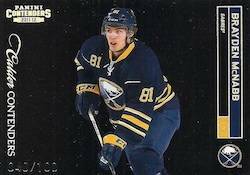 Although autographed rookie cards play a major part in the set, collectors may notice that the trademark "Ticket" design used across the brand in past years has been replaced by the more traditional Calder Contenders. Every hobby box has one autographed rookie card. All autographs in the release except for multi-player book cards feature on-card signatures. Autographs fall three or four per box including one Calder Contenders Rookie Card. Calder Contenders Auto Patches (one per case) combine over-sized patches with autographs from some of the hottest first-year players, such as Ryan Nugent-Hopkins and Gabriel Landeskog. NHL Ink autographs mix come in single, dual and triple signature versions. Signers include current NHL players and retired stars. Contenders Match-Ups, Original Six Combos and Starting Lineups are all multi-autographed book cards with up to six signatures. Cases promise one book card. Serial numbered Contenders Legacies and Cup Contenders base set short prints make building the set a little more challenging. I got a starting line ups booklet in the first pack I opened tonight…..nuff said! 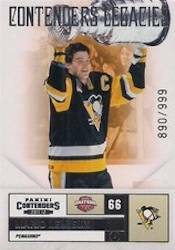 2011 12 PANINI CONTENDERS HOBBY HOCKEY BOX BUY 2 OR MORE BOXES SAVE $5 ! 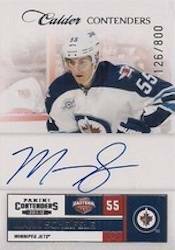 2011-12 Contenders Factory Sealed Hockey Hobby Box Ryan Nugent-Hopkins AUTO RC? 2011 12 PANINI CONTENDERS HOCKEY HOBBY BOX NUGENT HOPKINS LANDESKOG RC YEAR!